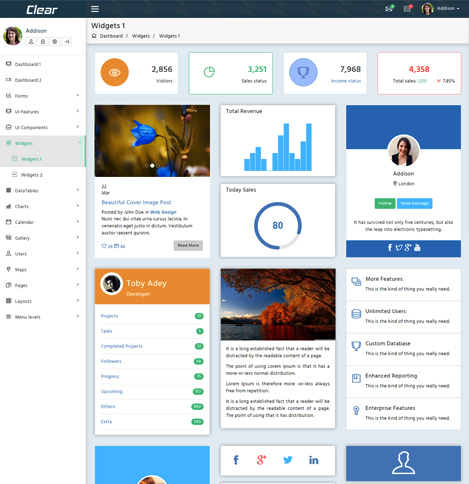 Clear is the Admin Template Which comes with awesome theme,efficient features with various types of components. Available in 4 different technologies (Bootstrap version, Laravel version, Vuejs version and laravel-vue version). 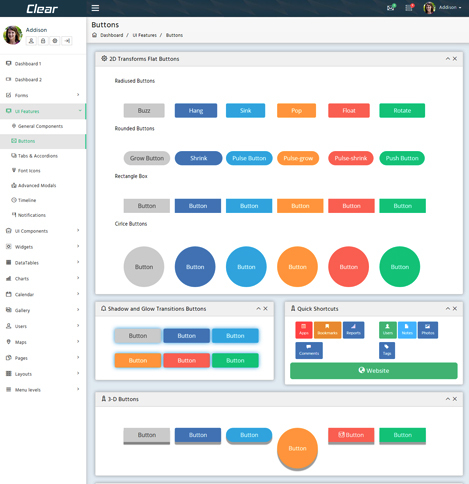 All versions comes with multiple layout and two themes. Spark skin is the major advantage for clear. 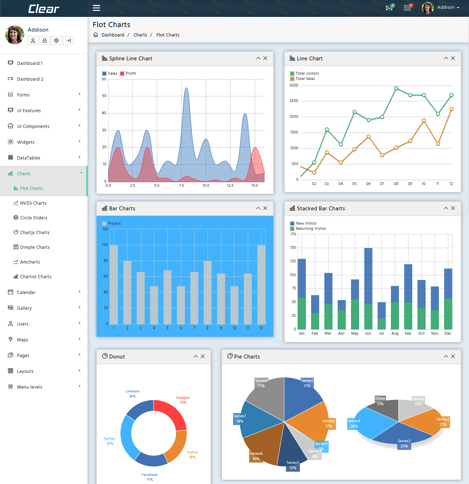 Clear Admin Template provides Light Theme which has the awesome Layout across Dashboard, components, widgets, general components and available with various types of charts e.t.c, Highly impression and look simple and stylishs theme towards color scheme. 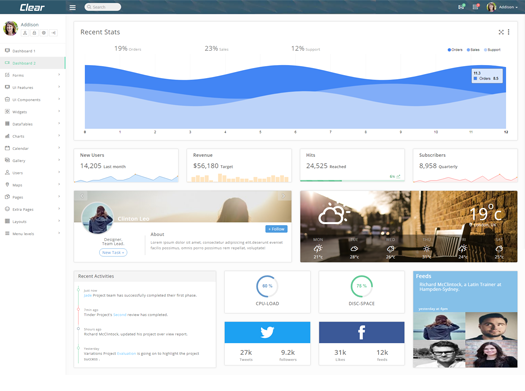 Clear Admin Template provides Dark Theme which has the Dark color Layout highly impressive easy to use components with simple and stylish clear view. 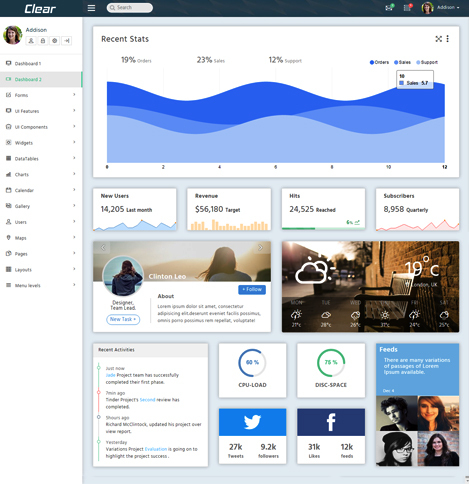 Clear VueJs DARK Theme which provide most useful features with great UI Design and It is the awesome Layout across Dashboard, components, widgets, general components and available with various types of charts e.t.c, Highly impression and look simple and stylishs theme towards color scheme. Clear VueJs DARK Theme which provides Light Theme which has the awesome Layout across all pages and it can definitely reduce your work and save time built with simple and understandable code in clear view. 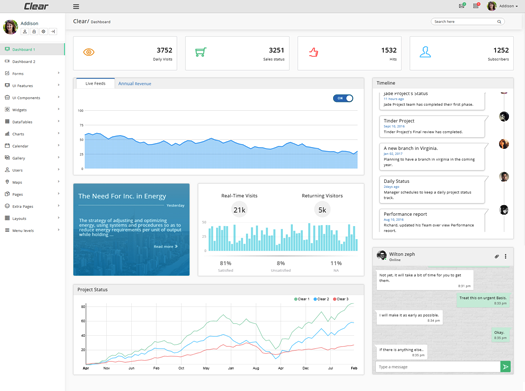 A dashboard is a special type of document and usually provides interactive features and express the profile of user. 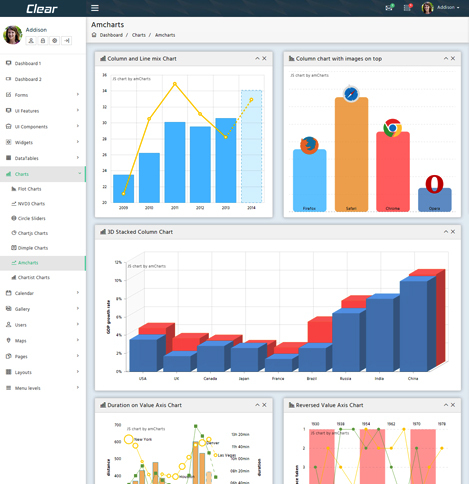 Calender defines A program that enables you to record events and appointments on an electronic calendar. Masonry is a dynamic grid, layout Masonry arranges elements vertically. just like a mason fitting stones in a wall. 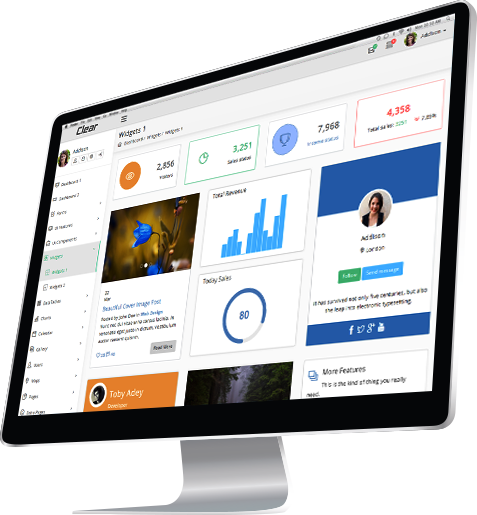 Clear User pages provides various types of user pages like registration, add user,view profile pages & maintain details in database. File upload defines facility of multiple file upload, include with start upload, Delete, cancel upload functionality. Charts defines analysis of particular product if any and provides various types of charts like nvd3,dimple charts. Clear provide error pages with necessary functionality and stylish look of design included. © 2017 Clear-Landing Page Developed by Lorvent team.